Hi Guys, this is my 1st project post, so please feel free to critique how I have laid out the story of this project. Three years ago I did a partial loft conversion and kept the off-cuts from the collar ties with the intention of “making something” at a later date. Since recently joining Lumberjocks, I have renovated my workshop and finally “made something” with the timber from my loft. I always felt as I was re-cycling the wood it was appropriate that it should go full circle and return to the loft; as a pair of Bedside Tables. Height 575mm x Width 365mm x Depth 365mm. The wood used was Scots Pine and was well seasoned. As I had not made a piece of furniture for 7 yrs. I made a conscious decision to stick to traditional methods of construction, as I felt this was an opportunity to get re-acquainted with some hand tools. 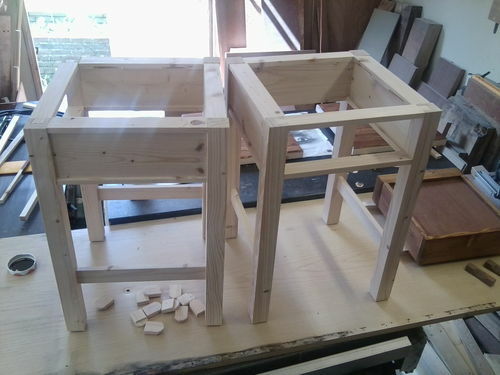 All of the main joints are mortise and tenon, apart from the top-rail into the leg which is dovetailed. 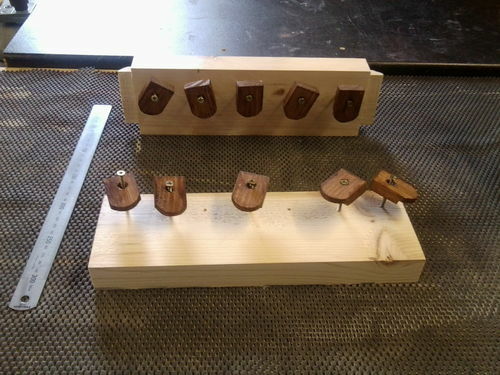 This is a pic of the turn-buttons I used to attach top to frame. After the initial machining I decided to stain the wood as I did not want a new Pine look. 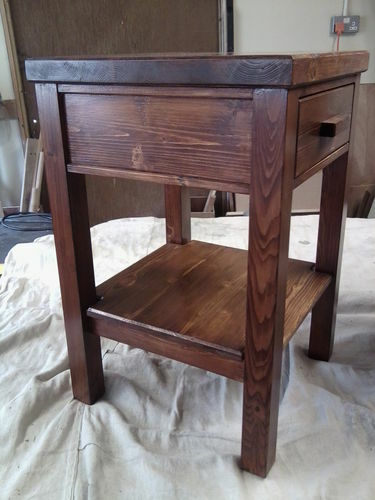 I applied 2 coats of walnut stain, 2 coats of Satin Poly Varnish, and finally 2 coats of furniture wax to give a more aged look, and also because I love the smell of wax. The chamfered mouldings you see on the sides (outside) act as a runner-kicker system on the inside for the drawers. The only component not made from my “LOFT” wood are the drawer handles. These are shaped from some Walnut I had available. There were some scary knots to contend with and I made up a paste of some Walnut-dust mixed with 2-pack epoxy resin. This seemed to act as a stop and an excellent dark filler, time will tell. Thank you for taking the time to have a look, and I would be grateful for any feedback/questions on any of the aspects of my 1st Lumberjocks build. Looks good. A project after my own heart. Love the colour and finish. Very nicely done and great looking. Joinery must have been time consuming. That table will last for centuries with those joints. Good work. Let’s hope this is the 1st of many (Lumberjock) projects. These are very attractive. Nice work. Very nice work. I particularly like the traditional joinery. The tables are now residing in the loft space from whence they originally came. I may have caught the re-cycling bug as my next project involves old fence-posts.